it can fall and break when reaching for the one you need. With this solution everything will be protected like new, chip and breakage free. Cooking, baking and cleaning your kitchen will be a lot easier when your cabinets and countertop is organized and crisp clean. Get this beautiful stem storage solution for a housewarming, Christmas, New Year's or just because. 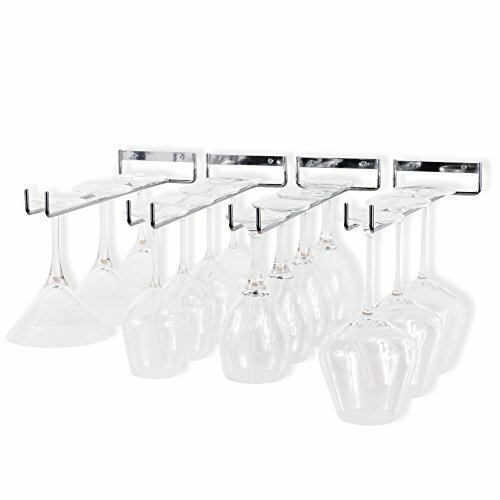 Each Wine Glass Drying Rack's Dimensions: Glass Holder L 15" Wall bracket W 5"
Great Quality: Made of good craftsmanship, these stemmed glass holders are amazingly organizational for all your gatherings. Each Rack's Dimensions: Glass Holder L 15" Wall bracket W 5"